This mail organizer is a must have for your 18" wall cabinet. This beautiful organizer provides storage for letters and keys. This unit is available in Natural Maple or White and comes with an easy to clean acrylic panel which adds a touch of elegance to any design and keeps your counter clutter free. 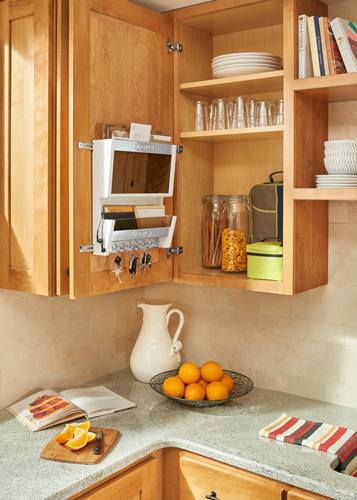 The mail organizer holds standard and flat envelopes, has eight key hooks and features patented adjustable mounting brackets that ensure easy, safe installation on variable door styles and can even be installed at the end of a run of cabinets or on a wall. 14-1/2" 3-3/4" 15-1/4" 14-1/2" 3-3/4" 15-1/4" 14-1/2" 3-3/4" 19"